Hidden behind an impressive oak gate amidst an old coconut grove at the mouth of turquoise sea Grand-Bay, in the north-west of Mauritius, 20° Sud Hotel offers the luxury of a 4-star Deluxe establishment in a refined haven. This small, intimate hotel, with 34 bedrooms and suites - including a terrace - is exquisitely decorated with antique furniture and furnishings. 20° Sud Hotel boasts two restaurants : one in the hotel and one on an old renovated boat - Lady Lisbeth. Its chef will surprise you with his fish and seafood dishes. The hotel's catamaran will take you to Flat Island for a barbecue seafood lunch in a pristine spot. It is also available for north island cruises or sunset drinks, while Lady Lisbeth sails every evening on a gastronomic and romantic cruise in the bay’s calm waters. At the spa “Comfort Zone”, a team of therapists welcomes you for western and oriental massages and aromatherapy. 20° Sud is ideally situated in the lagoon, perfect for water sports such as windsurfing, yachting and diving with a professional instructor and underwater photographer who will share his passion for the Mascarene marine fauna and flora. They are equipped to the standards of the Hotel 20°Sud but as a little extra, like the Suites, Nespresso® coffee machines are also provided. Their terraces open onto the ocean giving you the impression of living in privileged times as their proximity to the sea is truly unique in Mauritius. Modest in size, those rooms have a coconut grove view that opens onto the sea. All the rooms are air-conditioned and have a beautiful terrace which looks onto the attractive coconut grove bordering the sea. The rooms are tastefully furnished and equipped with queen-size bed, safe, plasma extra flat screen television (17 channels Canal Satellite), telephone and free, unlimited access to high speed WIFI internet. Each bathroom is equipped with an old style bath, a separate shower and two wash basins built into a beautiful wooden surround. The mix of antique furniture gives this place a truly distinctive atmosphere: warm, unique and personalised. Although some are more modest in size, all overlook the beautiful coconut grove that opens onto the sea, allowing you to “live” the 20°Sud experience at a reduced rate. Modest in size, those rooms have a coconut grove view that opens onto the sea. All the rooms are air-conditioned and have a beautiful terrace which looks onto the attractive coconut grove bordering the sea. The mix of antique furniture gives this place a truly distinctive atmosphere: warm, unique and personalised. Although some are more modest in size, all overlook the beautiful coconut grove that opens onto the sea, allowing you to “live” the 20°Sud experience at a reduced rate. Anotheron a beautiful old boat renovated by the hotel: the M/S Lady Lisbeth. The kitchen is directed by the talented Mauritian chef, Manolito Grosset, who gained his experience in the finest hotels of Mauritius as well as in a starred restaurant in Switzerland. He will prepare some delicious fish-based dishes just for you. The fish are caught off the shores of the Mascarene Islands and include varieties such as babonne, vieille rouge (red wrasse), coryfène sea-bream, sacréchien and vacoas. The meat is just as tasty and comes from South Africa. 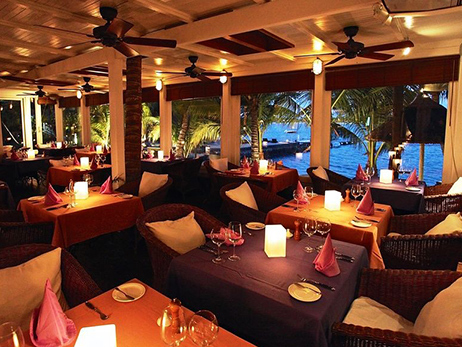 The hotel’s restaurant is situated just 10 metres from the sea. Several different dining areas are at your disposal: at the edge of the main swimming pool, inside or on the seashore. To make you feel at home, your breakfast is available at anytime. And everyday a “4 o’clock tea or coffee” is served, free of charge, accompanied by a delicious freshly-made homemade cake. When salvaged only the hull was still in good condition. All the superstructures were rebuilt, had replica masts made of the originals and the antique fittings were bought from a boat scrap yard near Bombay. Every evening she sets sail on a gastronomic cruise around the bay. Reservations for eight passengers only. Boarding is at approximately 19.45. Welcome drinks are served on the deck before the boat leaves its mooring at the hotel and heads towards the calm waters of the Grand Baie where it anchors, just off the town, for dinner. The return to the hotel is planned for 11 pm. She is also available for private hire or for functions (intimate weddings, cocktail parties, birthdays etc.). Make the most of this unique opportunity on Mauritius to spend a romantic evening under the stars on a ship from another era! The Governor’s House is housed within an old ruin dating from the 19th century, now a listed building is a little restaurant we have fitted out in the middle of nowhere: Just a few tables, a magical setting on a wild beach looking out to sea within lush and protected surroundings. Every effort is made to respect the natural environment, even your shower water is desalinated using solar energy. A team of therapists welcomes you daily from 9.00 a.m. to 8.00 p.m. 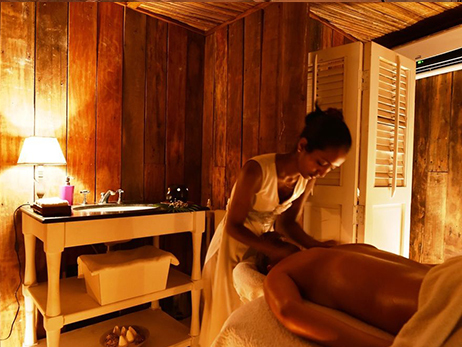 The facilities offer four treatment rooms, two of which are double rooms so couples can to be massaged together. A beautiful hammam and whirlpool bath are also freely available to you (no booking required). Hot stone massage, ayurvedic massage, aromatherapy essential oil massage, oriental foot massage, relaxing oriental massage, mediterranean massage with basil, lemon, mandarine, and bergamot essential oils, a hot oil neck massage etc. Aromasoul oriental exfoliating mother of pearl powder body scrub, peeling with flower petals, draining envelopments,detoxifying and decongesting monticelli mud wraps with white crystals or royal jelly, anti-stress, relaxing, slimming and restorative treatments as well as specific treatments for comforting aching legs. The “Lovers’ Retreat”: 150 min of pure shared pleasure… a crystal peeling with flower petals, a Monticelli mud wrap, a relaxing hot oil massage perfumed with sensual jasmin, followed by a flower petal bath. Grand Baie is a real paradise for all watersports. The hotel boasts a very privileged location on the edge of the lagoon, just at the mouth of the bay, offering novices as well as experienced yachtsmen and women the opportunity to satisfy their passion. The wind direction, usually "inshore", provides a degree of security. Several windsurfs are available for your use and are equipped with sails of different sizes. A Hobie Cat 15catamaran, and a Laser are also at your disposal. 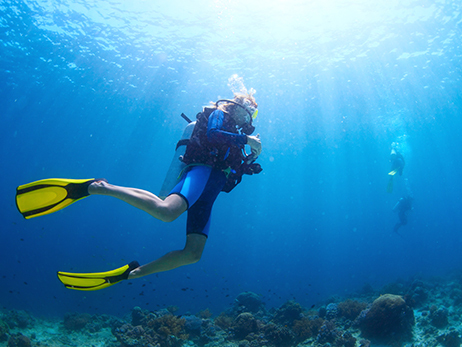 The hotel's diving club, the "Mascareignes Plongées" (Mascarene Diving) was established in February 2005 and became the first Nitrox diving centre to be recognised by the authorities. The monitor, Jean Lincoln, a two-star MSDA/CMAS instructor, (Nitrox and Gas Blender), first aid worker, O2, AED DAN and Red Cross instructor as well as being an underwater photographer, will share his passion for the flora and fauna of the Mascarene Islands with you (giant morays, carangues, rays, sharks, turtles, dolphins...) and take you to some enchanting sites (numerous shipwrecks and coral reef only 5 minutes from the hotel). The club has both Scubapro and Mares material available for use and is equipped with an 8-seater speed boat driven by two 60 hp. motors. 20°Sud is ideally situated to the north of the Island of Mauritius, on the edge of the lagoon of Grand Baie. This location gives guests easy access to a wide variety of activities related to big-game fishing, including traditional big-game fishing, “jigging” and “popping” (casting), in deep water but also around some of the numerous small islands, shipwrecks and reefs within the immediate vicinity. The diversity of species present around Mauritius makes it an ideal destination for amateurs of this renowned sport: marlin, blue fin tuna, yellow fin tuna, coryfène sea-bream, Wahoo, trevally… there’s a huge choice! You can choose from either full-day or half-day trips. The hotel has one 18 m and two 14 m boats at its disposal. We strongly advise you to contact us before your arrival, and several weeks before the beginning of the season, to make a reservation for such trips. The hotel has several boats for a variety of activities available for your use: a Lagoon 440catamaran, an antique wooden boat, restored by the hotel owners : the M/S Lady Lisbeth (see menu "Lady Lisbeth"), a speed boat, a free shuttle service to Grand Baie, a traditional Mauritian boat, not forgetting a Hobbie Cat 15, a Laser, windsurfs, 2 stand-up paddle boards Naish Manaetc. The property has two very beautiful fresh water swimming pools. One of these pools is heated to 26°C in winter to ease the refreshing effects of the cool southern nights. The two ground floor Austral Suites each have a small private plunge pool overlooking the sea. You can play billiards in the very beautiful air-conditioned library. The table was made by “Le Billard Breton”. It is an american-type table measuring 2.80m long. There are two internet zones at your disposal and WIFI access throughout the property. A free shuttle service four times a day to Grand Baie (by traditional motorboat pirogue) - two librariesoffering you a choice of over 2000 books,- Videos on Demand system (Pay TV proposing more than 160 movies) - Loud speaker dock for Ipod(in categories Beachfront, Suite and Austral Suite) - board games: backgammon, chess, cards, Monopoly, Scrabble, Rummykub etc. - a shop - bicycles,- VIP transportation from/to airport or island tour in a luxurious car (20°Sud BMW X5, or equivalent) - boathouse services providing masks, flippers, sea kayaks, laser, catamaran Hobie Cat 15, stand up paddle Boards, windsurfs etc.